The Mourning Stamps and Covers Club publishes a quarterly newsletter/journal entitled Mourning Notes. A publication of approximately 20 pages an issue, it is available in an electronic version sent to members by e-mail in full color, or a black and white printed copy sent by regular mail. 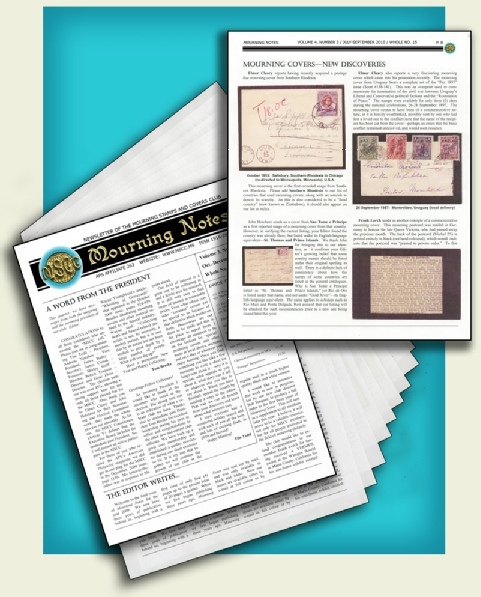 Mourning Notes features regular articles on various aspects of US and “foreign” mourning covers and their postal history. Other regular columns treat such subjects as advertising mourning covers, mourning “cinderellas” and paper ephemera, as well as mourning stamps. The journal also keeps a running census of “countries that used mourning covers,” and other categories of specialized mourning cover collecting, such as US Presidential widow free franks, hand-made mourning covers, etc. Subscription to our quarterly newsletter/journal is included with membership in the Club. Back issues of Mourning Notes are available for purchase at cost by new members. While individual copies of the publication may be purchased by interested parties and/or non-members at a cost of $10.00 per issue, taking out a club membership is cheaper and is always encouraged.